A friend and I like to watch movies together, though we live a thousand miles from each other. We just pick something off Netflix and chat on Facebook. I know it sounds corny, but I guess neither has much going on, so this is something to do. 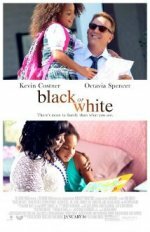 Last night we watched Black or White. Kevin Costner plays Elliot. This is the second movie I’ve seen where Kevin Costner plays Elliot. Can you guess the other movie he plays Elliot in? Anyway, in Black or White, Elliot is a successful lawyer and an alcoholic. At the very beginning of the movie, we learn that Elliot had just lost his wife in a car wreck. But what’s more, Elliot has a granddaughter named Eloise (Jillian Estell) who was left in the care of him and his wife when his daughter died giving birth. Now that Elliot’s wife has also died, he is Eloise’s sole guardian. Eloise’s paternal grandmother, Rowena (Octavia Spencer), wants custody of the girl. Rowena believes Eloise would be better off raised by her. Elliot objects to this, mostly because of Reggie (Andre Holland), who is Rowena’s son and Eloise’s father. Reggie has a criminal and drug history and Elliot does not want him around Eloise. And so there’s a legal battle over who gets custody of Eloise. My friend and I agree that this is a beautiful movie.